The 2018 edition of the Grand Prix d’Horlogerie de Genève (GPHG) has just published the list of “pre-selected” (shortlisted) watches in the run-up to the eagerly anticipated red-carpet event in Geneva on November 9, 2018. The categories for 2018 constitute the following: Ladies, Ladies’ Complication, Men’s, Men’s Complication, Chronograph, Chronometry, Mechanical Exception, Sports, Jewellery, Artistic Crafts, Petite Aiguille (watches with retail prices between 4,000 and 10,000 Swiss francs), and Challenge (watches with retail prices under 4,000 Swiss francs). The pre-selected watches will go on a world tour, starting with Venice on September 28. From there the watches will travel to Hong Kong and Singapore before returning to Geneva’s Musée d’Art et d’Histoire for public viewing from October 31 through November 14. 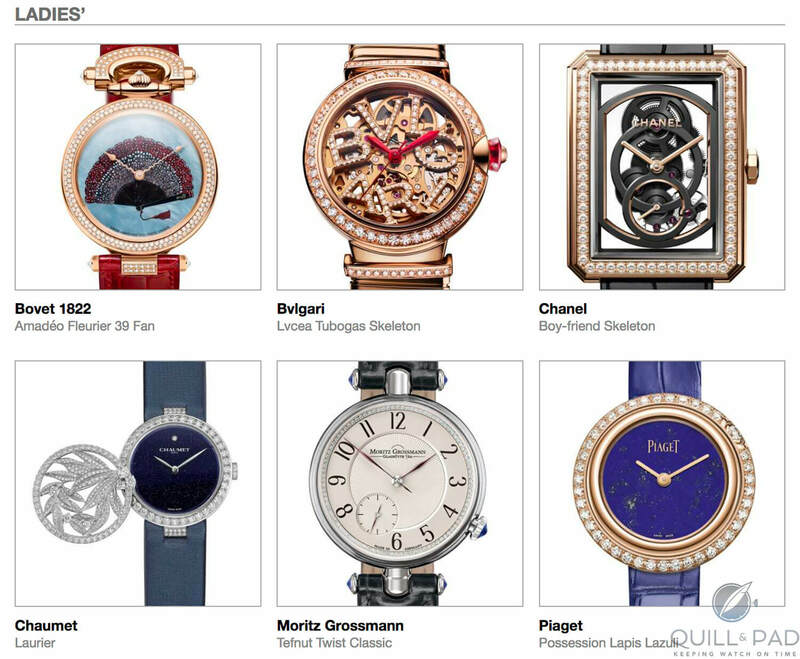 But enough preamble, let’s have a look at the watches that are in serious contention for the prizes as of today. The Ladies category contains watches made expressly for the female wrist comprising only the following indications: hours, minutes, seconds, date, power reserve, and/or classic moon phase. These timepieces may be adorned with a maximum of eight carats’ worth of gemstones. For more information, please visit gphg.org/horlogerie/en/gphg-2018/pre-selected-watches#2018_DAME. According to this category’s description, Ladies Complication constitutes women’s watches remarkable in terms of their mechanical creativity and complexity. These may feature all kinds of classic and/or innovative complications and indications like the annual calendar, perpetual calendar, equation of time, moon phase, a digital or retrograde time display, world time, dual time, or others. These do not fit the definition of the Ladies or Mechanical Exception categories. For more information, please visit gphg.org/horlogerie/en/gphg-2018/pre-selected-watches#2018_COMPLICATION_DAME. Men’s watches comprise the following indications: hours, minutes, seconds, date, power reserve, and classic moon phase. 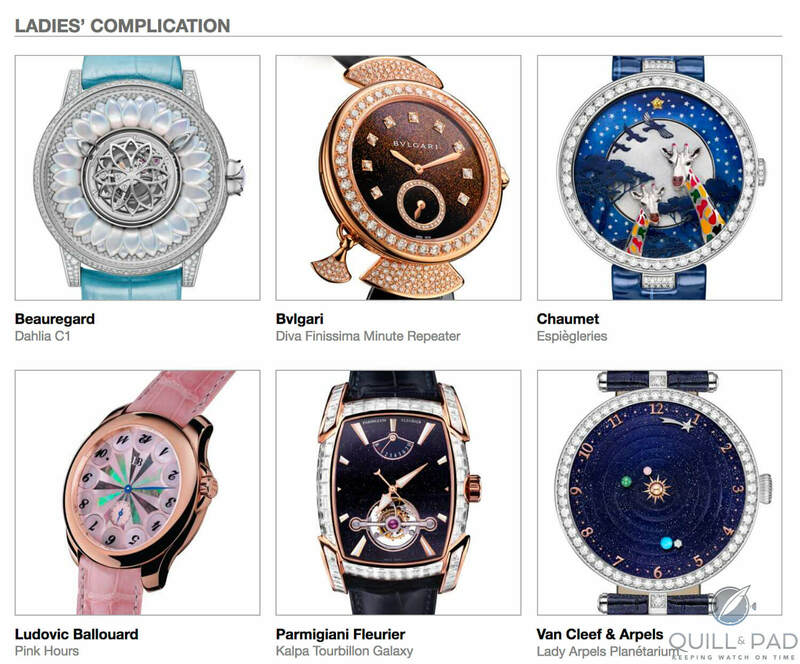 These timepieces may be adorned with a maximum of five carats’ worth of gemstones. For more information, please visit gphg.org/horlogerie/en/gphg-2018/pre-selected-watches#2018_HOMME. Akrivia Rexhep Rexhepi Chronomètre Contemporain: A Fork In The Road, A Pivot, Or Something Else Entirely? 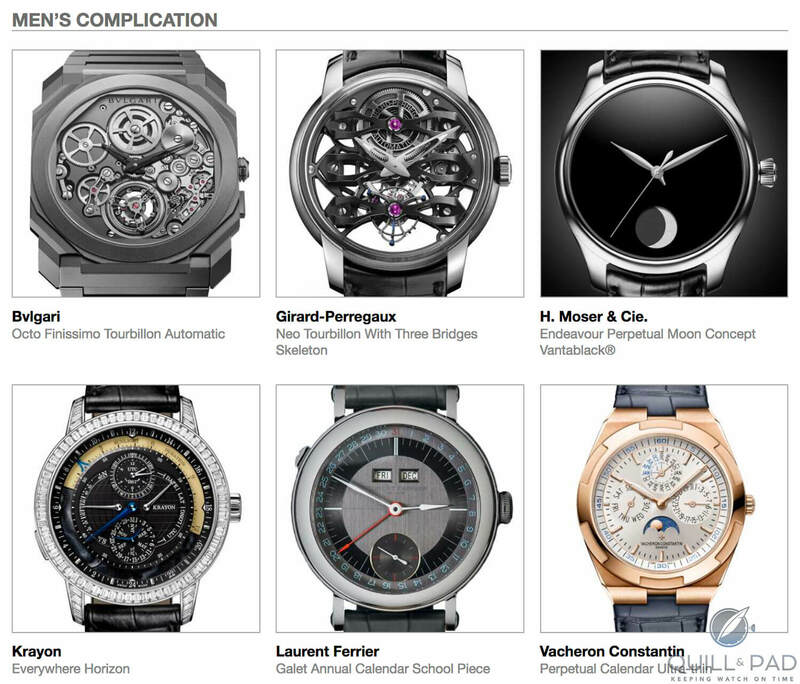 These are men’s watches remarkable in terms of their mechanical creativity and complexity. These may feature all kinds of classic and/or innovative complications and indications like the annual calendar, perpetual calendar, equation of time, moon phase, a digital or retrograde time display, world time, dual time, or others. These do not fit the definition of the Men’s or Mechanical Exception categories. For more information, please visit gphg.org/horlogerie/en/gphg-2018/pre-selected-watches#2018_COMPLICATION_HOMME. For more information, please visit gphg.org/horlogerie/en/gphg-2018/pre-selected-watches#2018_CHRONOGRAPHE. In the Chronometry category – renamed from last year’s “Tourbillon and Escapement” – we find mechanical watches that contain at least one tourbillon and/or a special escapement and/or another development improving precision timekeeping. Additional indications and/or complications are admissible. For more information, please visit gphg.org/horlogerie/en/gphg-2018/pre-selected-watches#2018_CHRONOMETRIE. The Mechanical Exception category features men’s or ladies’ watches with a special mechanism such as an innovative or sophisticated display, an automaton, a belt-driven movement, a striking or other acoustic function, or any other original and/or exceptional horological concept. For more information, please visit gphg.org/horlogerie/en/gphg-2018/pre-selected-watches#2018_EXCEPTION_MECANIQUE. The Sport category contains watches linked to the field of sports, whose functions, materials, and design are suited to physical activities. Smartwatches are admissible here. For more information, please visit gphg.org/horlogerie/en/gphg-2018/pre-selected-watches#2018_JOAILLERIE. For more information, please visit gphg.org/horlogerie/en/gphg-2018/pre-selected-watches#2018_METIER_D_ARTS. Watches entered into the Petite Aiguille category are offered for a retail price that falls between 4,000 and 10,000 Swiss francs. For more information, please visit gphg.org/horlogerie/en/gphg-2018/pre-selected-watches#2018_PETITE_AIGUILLE. 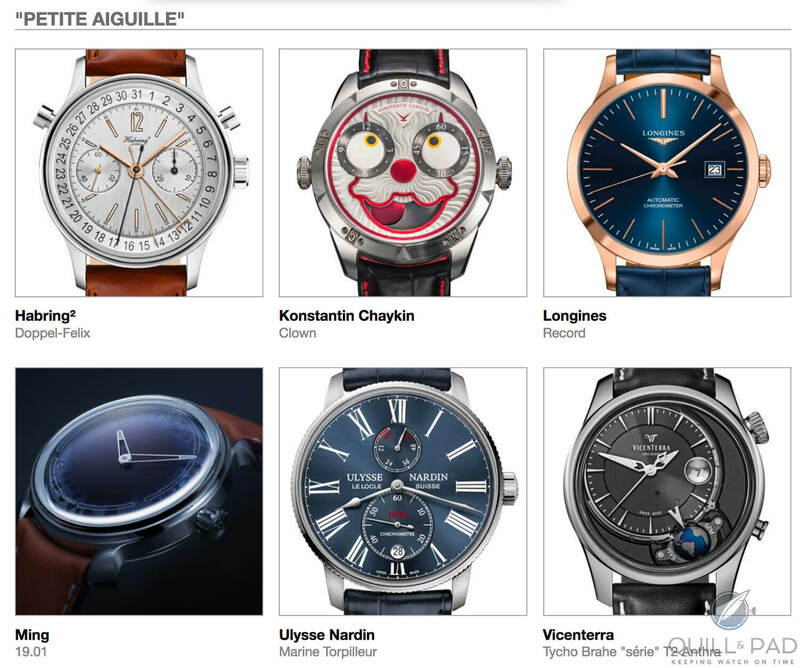 Watches entered into the Challenge category are offered for a retail price under 4,000 Swiss francs. For more information, please visit gphg.org/horlogerie/en/gphg-2018/pre-selected-watches#2018_CHALLENGE. In case you missed our coverage of the 2017 event, you might like What We Liked And What We Didn’t At The 2017 Grand Prix d’Horlogerie de Genève, Plus How Well Our Panel’s Forecasts Did.